A cool and confident Mark Byford walked into the Baillie Gifford Corner Theatre at the Edinburgh International Book Festival on Wednesday afternoon to discuss his compelling account of the Vietnam War and the cost of conflict in his new book, A Name on a Wall: Two Men, Two Wars, Two Destinies. Sir Menzies Campbell in his role as chairperson introduced Byford, a journalist and former BBC Deputy Director General, to the assembled audience. 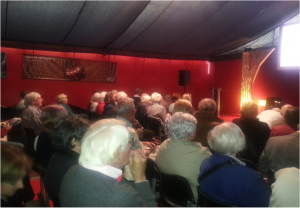 The author set the scene as he explained the remarkable coincidences that inspired his literary journey before reading aloud passages from his work to the attentive crowd. 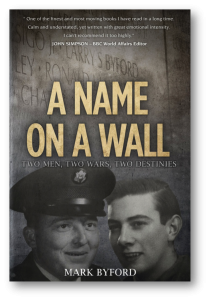 The book revolves around the lives of two seemingly contrasting and unrelated men who happen to share the same surname of Byford. 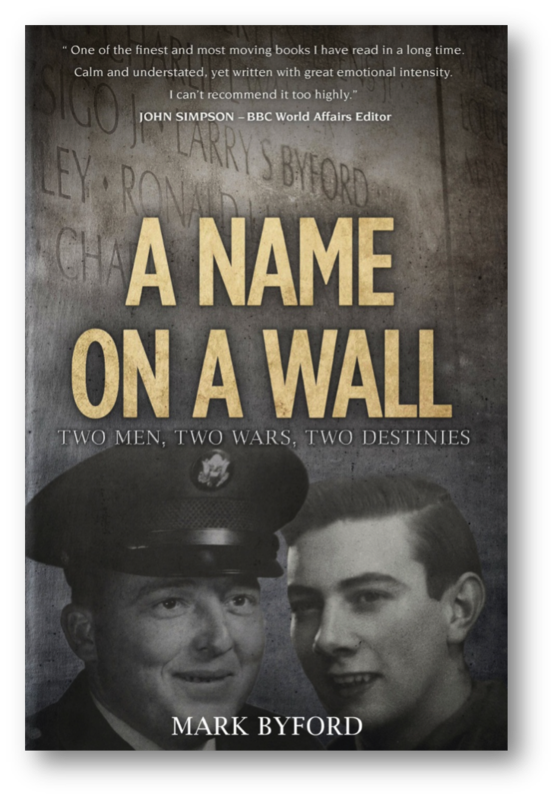 The first of these men is the author’s father, Lawry Byford, a solder in the Second World War, who served with the American army. The second namesake is Larry Byford, an American soldier who fought and died in the Vietnam War. The author interweaves the experiences of both men to explore the impact of war on their personal and interior worlds. For one man the outbreak of war presented an opportunity for his talents to be recognised and offered him the potential to embark on a different professional path. Whilst for another the war ended a life and destroyed any aspirations he may have held. Byford’ s talents for reportage, accuracy and authenticity, honed during his career as an investigative journalist, can be identified on account of the impeccably researched nature of his work. Every conceivable source of information from eye witness accounts to official documentation is drawn upon to flesh out the lives of the two men and the extraordinary and divisive times they lived in. During a stay in Washington D.C., at five o’clock in the morning, Byford decided to take the opportunity to visit the Vietnam Veterans’ memorial, more commonly known as ‘the Wall,’ before the start of an unrelenting working day. On his arrival he was deeply moved by the impact of this commemorative memorial and observed a shaft of sunlight illuminating a single name etched onto the stone – that name was Larry Byford. A nearby veteran and gatekeeper observed a reflective Byford and instructed him to take a rubbing of the engraving. Upon hearing that the author’s father was a surviving veteran of World War II he insisted that the writer give the rubbing to his father. Byford candidly confessed he took the tracing merely to appease the old veteran and after returning to England placed the folded paper into a draw where it sat for unfurled for some time. It is an astonishing coincidence that of the 58,282 names listed that this particular appellation should catch the author’s attention. The turning point that would link this set of coincidences came when Byford decided to talk to his father about his own experiences during the Second World War. Over the course of their discussions, Lawry took his son to his hometown in Yorkshire and brought him to a memorial which listed the names of all 76 townsmen who tragically did not return from the Second World War. With great insight the elder Byford shared an eternal truth with his son that behind every name there is a story. After considering these words the author determined to discover the story behind Larry Byford — the name on the wall. As the author uncovers the narratives of the two military men (who fought in very distinct wars) he also addresses broader thematic issues. Byford questions the cost of conflict, the nature and meaning of duty and the legacy of war. Crucially, he also assesses the extent to which the scars of war are still being healed. One of the key strengths of A Name On a Wall is how the author demonstrates from understanding the particular the universal can be discovered. It was with integrity and honestly Mark Byford shared with the assembled audience the remarkable literary and personal journey he undertook in the research and making of this book, prompting this listener to reflect on the sacrifices of war. Article contributed by Aisling MacQuarrie. 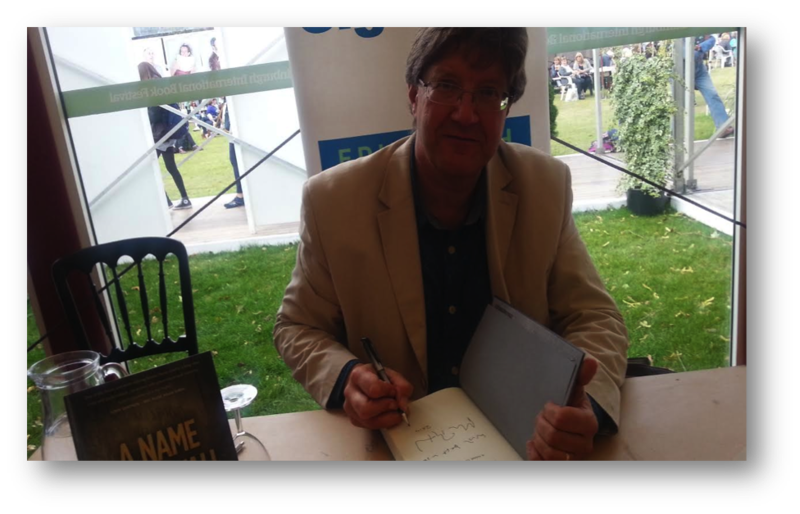 This entry was posted in Edinburgh International Book Festival, World War One on 3 September 2014 by davidjarman.